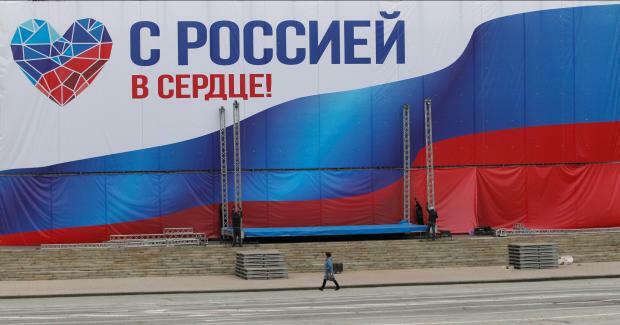 A woman walks past a banner reading "With Russia in the heart!" ahead of the upcoming vote for a new leader of the self-proclaimed LNR in Luhansk. The United States called the elections a charade to give false legitimacy to Moscow-approved leaders already installed in the self-proclaimed Donetsk and Luhansk People's Republics. It announced new sanctions on Russia on Thursday. "These particular elections are a mockery, really, of the idea of genuine elections that need to be held," Kurt Volker, Washington's envoy to the Ukraine conflict, told reporters on a conference call on Thursday. "They are under conditions of occupation, where there is no freedom of expression, no freedom of movement, no freedom of campaigning, and generally therefore no freedom of choice for the people in electing candidates for legitimate local leadership positions," he said. Ukraine's President Petro Poroshenko called the elections "illegal and represent yet another example of Russian subversive activity." "Actually, the deplorable situation with the implementation of the Minsk package was provoked by Kiev's unwillingness to fulfill the Minsk agreements," Kremlin spokesman Dmitry Peskov told reporters. The Donetsk region's acting head, Denis Pushilin, is running in Sunday's election after his predecessor Alexander Zakharchenko died in an explosion in August. Russia pointed the finger at Ukraine, while Kiev's security service blamed internal fighting "between the terrorists and their Russian sponsors". "Pushilin is a soap bubble, there are completely different people behind him, this is Moscow," a former separatist leader Alexei Alexandrov told Reuters. Ukraine-based analyst Volodymyr Fesenko said Russia was using the elections to give legitimacy to the region's leaders and may try to turn the fighting into a frozen conflict with the two breakaway regions as protectorates. Peskov acknowledged Russia had influence on the region's leaders but said "it is not unlimited."